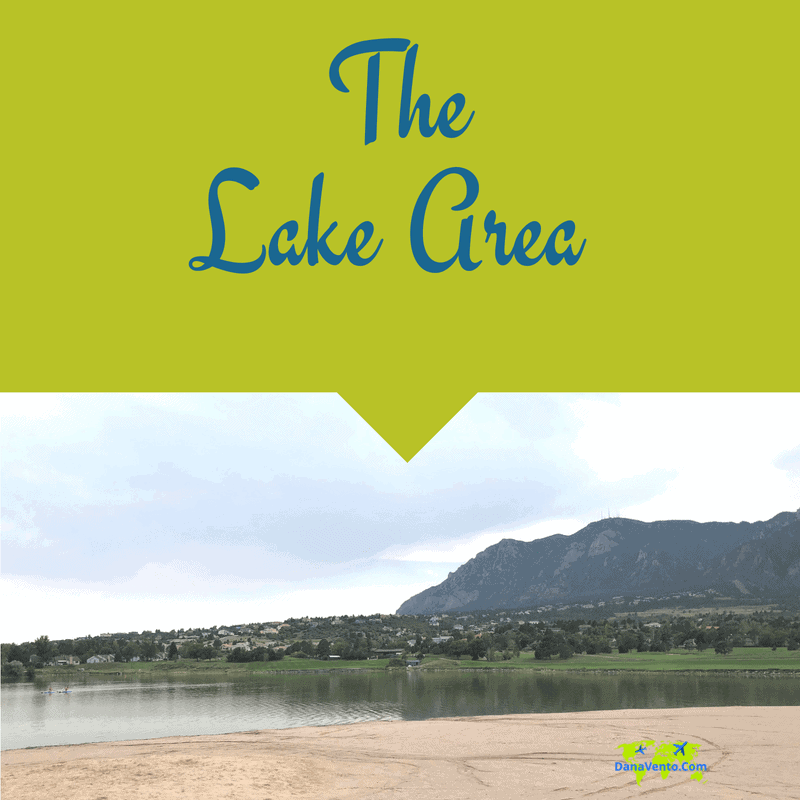 Families seeking something for everyone and heading out to Colorado Springs , Colorado, will want to bookmark this post, without exception. When you have kids and you want to have a fabulous time, the resort I am about to share is where it’s at. Golf, pool time, restaurants, well-appointed rooms and space where you see kids walking around un-escorted. Yes, I found it! Families abound here so it’s easy to fit in! Honestly, I can’t remember a time, that I have visited a resort and seen so many families, and I am about to reveal why! Families with toddlers to teens were here and the secret is located within the resort. Just in case you are wondering, we were minutes away from Garden of the Gods, Manitou Springs, the USA Olympic Training Center and only about 45 minutes from the Royal Gorge Region. 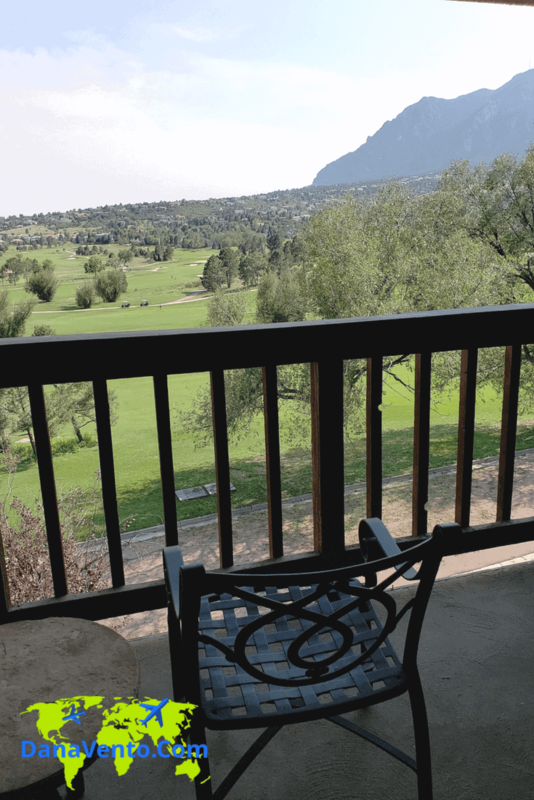 The Resort I am about to share with you boasts an incredible view of the Rockies and a Pete Dye-designed golf course all that will win you over from the minute you arrive. 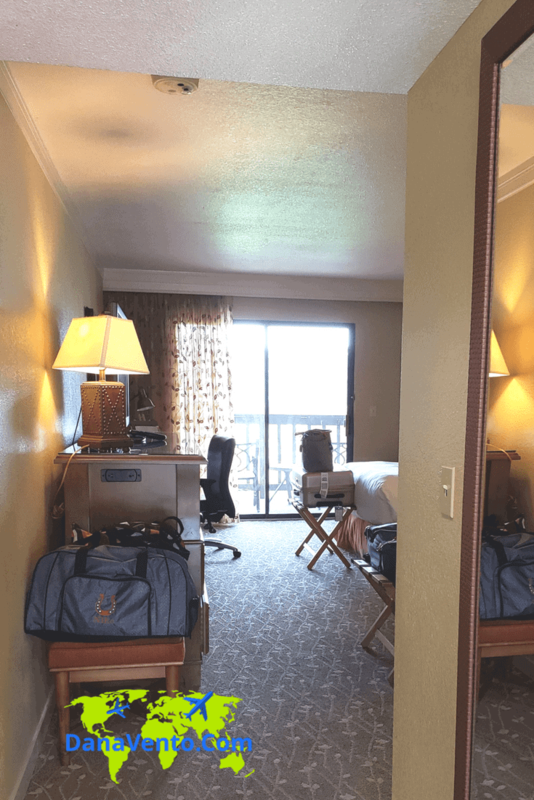 Pack up, Go West and head to the family-friendly resort loaded with amenities in Colorado Springs that I am about to share with you. Like I said, centrally located and impeccable views are just a few of the perks of this Colorado Springs resort. Now you are seeing what I saw, it’s crazy beautiful right? I’d like to thank Colorado Springs & Cheyenne Mountain Resort for a great stay! Imagine a resort, nestled at the foot of the Rocky Mountains. Where each morning you are greeted by a quiet and pristine environment, while you sit and sip coffee on your balcony. It’s about to happen, your vacation will be amazing because your family will love it too! The resort is a gem and a hub of activity. Rest and relax or get active, your choice, your getaway! When I pulled into the Cheyenne Mountain Resort his as the first thing I saw, and my initial reaction was, ‘WOW’! What will yours be? Keep reading to see why this resort is so family perfect! What did you imagine the inside would look like? Well if spacious, welcoming and gorgeous were your thoughts you are dead on right! Who is ready to have a great time? 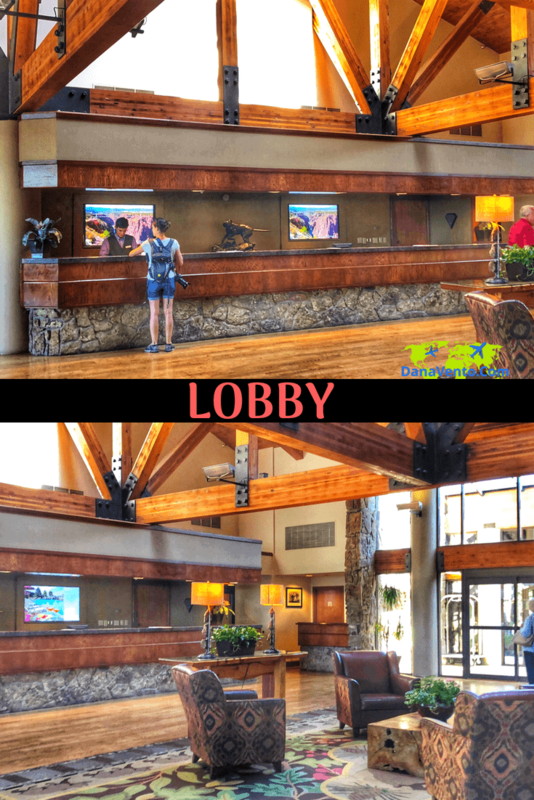 It’s an enormous front desk area, coupled with scenery and great eateries. A little side note. When you are on your way to the outside terrace, there is a fresh water station with lemon iced water and plain water. In between the water dispensers are chocolates my teen found them right away. You can fill your glass or bottle up, and it is a very busy little spot. 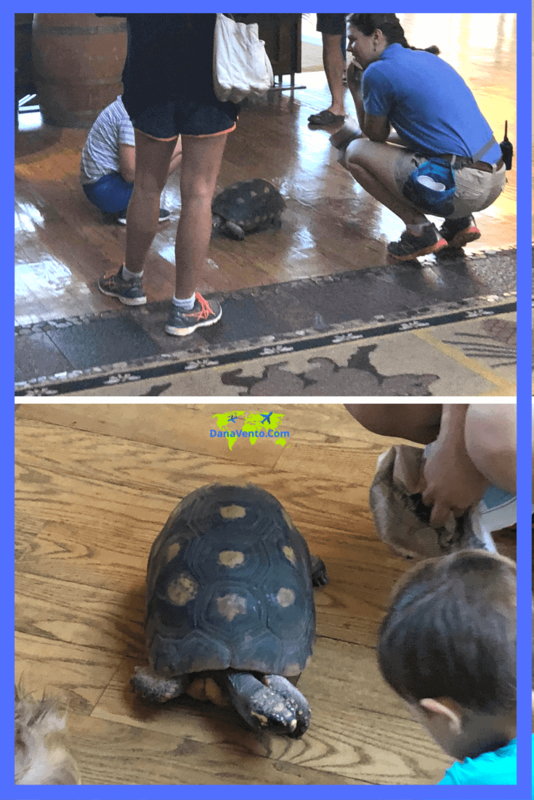 One day, well morning, while walking through the lobby we saw a turtle walking across the floor and tons of kids flocking to it. It was so random, yet it was not. The Colorado Springs Zoo brings animals for the kids to enjoy from time to time and we were fortunate enough to get to see this all taking place! As a mom of teens, it is often tough travel if there is not enough to do where we are staying. Hotels are often limiting in both space and amenities because often they are short-term stay versus a few days or the week. Resorts, however, differ. When we travel with our teens they want a bit of space, and the freedom to walk the resort. What’s super amazing about this resort is the fact that there’s plenty of space, pools, a lake, a golf course, a full athletic center, a spa, dining facilities, and many families of all ages staying here. Not every day is going to be a, “let’s get out of bed and start touring” kind of day right? So when the resort has amenities that you can plunge into full throttle, rather than getting into a car, it makes it easier on both the kids and the parents. Now when I say stay, I don’t just mean for a day, but for multiple days, at least 4 as we found out. No parent catches a break when they travel as a family unless they end up at a resort that captures something or everyone. Everyone moans about something and we often count down the minutes till we can sip on our cocktails to casually fade the complaints. The thing is, if you plan you are ‘where to’ right, the groaning will only last as long as the flights or car ride. Once there, let the good times roll and let the beer flow! 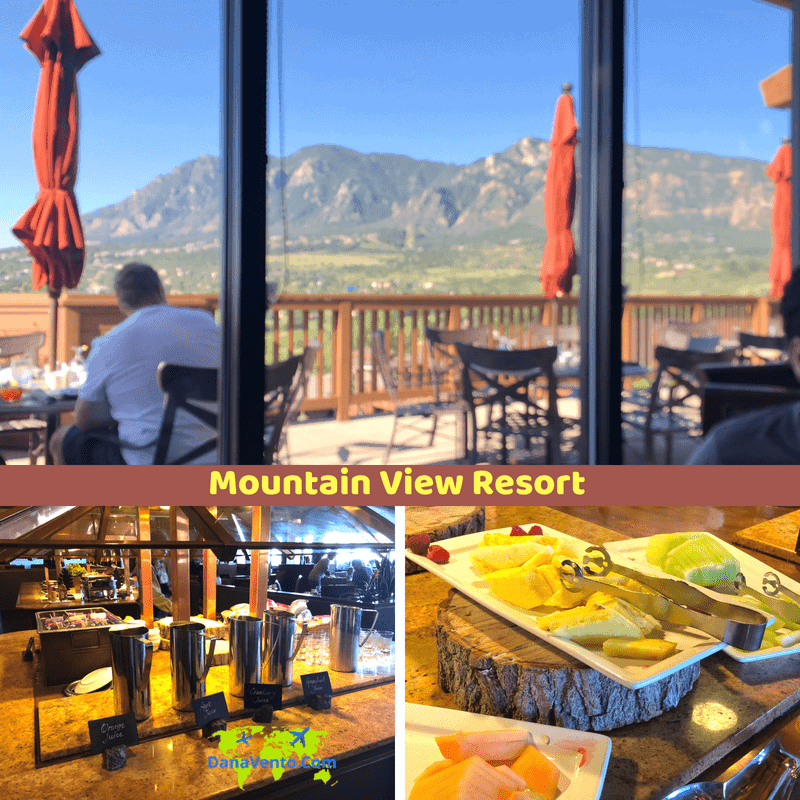 Cheyenne Mountain Resort is family friendly and lets’ adults be adults. Poolside you can order up beverages and snacks for both kids and adults, while the restaurants offer a great selection of eats. It’s that moment, the moment when I put the keycard on the door and pray so hard that the room will be nice. Trust me, I have been in plenty of places that I have walked away from and stayed elsewhere. Please, don’t let this be one of those places because I love the exterior. What will the inside be like? Will it be comfortable? Clean? Will there plenty of space? Could a family of 4 be in here? How do we get privacy? Let’s take a look. 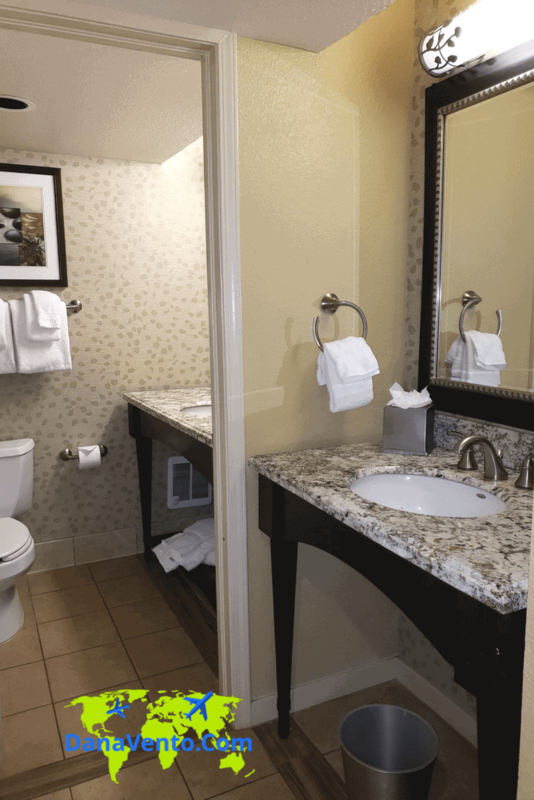 The rooms are generously apportioned, and the 2 separated sinks allow someone to use the shower and toilet while someone else is brushing and prepping in the other area with privacy! Take a peek at my video to see our room and all of the amenities from pump bathing gel, to hairdryers. What else is in the room? Did you see the closet? I loved that it opened on both sides and in there you will find the hairdryer, the iron, ironing board, and robes. The robes are an easy grab after a shower so you can move it on to the next person that needs to get cleaned up without ending privacy rights. Additionally, a balcony with seating helps separate you a little if you choose to just be outside while the family hangs inside or starts to fall asleep! The view of the majestic Rocky Mountains will greet you each day and as you walk the property. 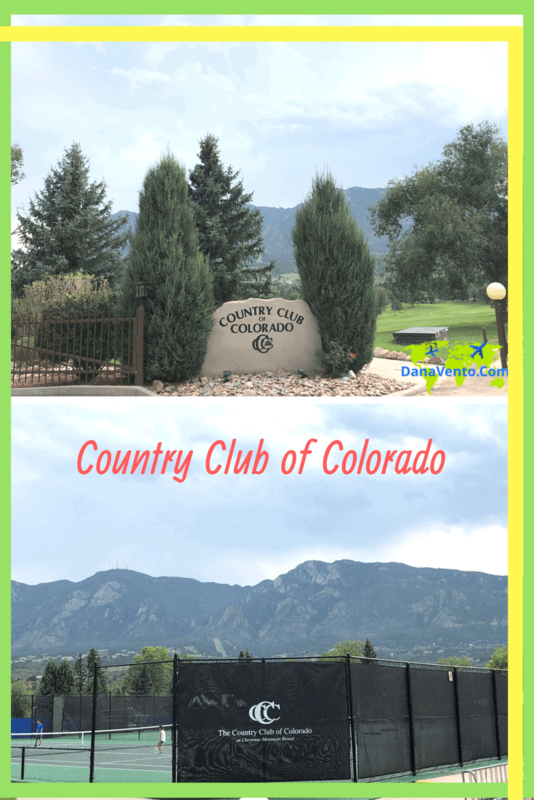 Not only do you get the Cheyenne Mountain Resort, but also the Colorado Country Club, right on the property. You can easily walk from your room to the golf course, tennis courts, athletic facility, and Aquatic Center. What a great bonus or value for your resort stay. When I saw the spa and state of the art athletic center I was excited, but that was just the beginning. You will see families everywhere. In fact, more families than I have seen anywhere besides a beach. It’s fantastic to be honest. We saw kids from babies to teens, twenty-somethings, multi-generational families etc. Kids were walking to and from their rooms to the pools, and in every common area, which is welcoming and speaks volume to the facility and how people feel about allowing their children to roam. At the entrance, there is seating, a front desk, a men’s locker room, a women’s locker room, towels for the pool and then the doors to the outdoor courtyard of fun. The lake, pools, snack bar and seating. Ready? Inside the locker rooms, you will find everything you need from changing facilities to bathrooms. There are lockers, cream, deodorants, etc. Not only is this for guests of the resort, but for true members of the country club. 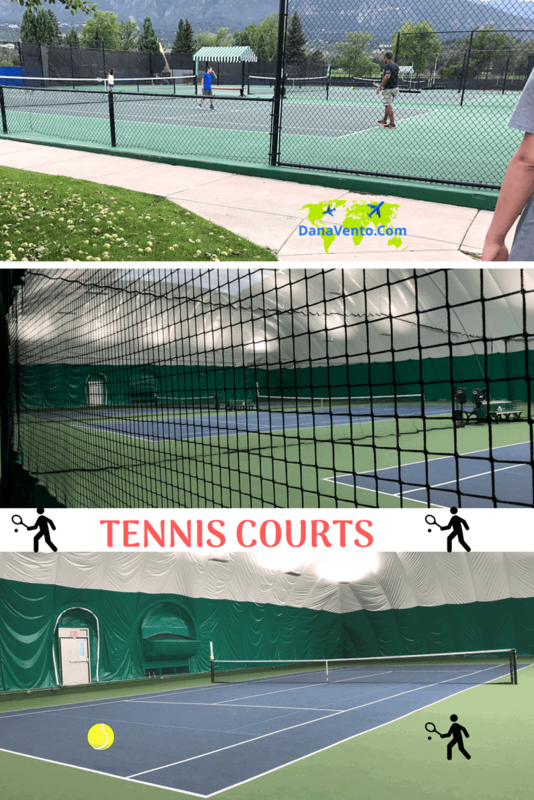 Continue walking down the trail or through the tennis courts you will find the Aquatic Center. What you need to know is that you can drive here and park from your room. It is an easy walk and parking can be a mess on the weekends. Not being negative, just a fact, so keep that in mind. People pushed strollers down, which made it a tad easier and you can also call on the valets at the front desk and they will ride you down in a golf cart, so really you have endless options to get there, it’s just about deciding how! Let’s look inside the center, ready? Here is where you will have the best of the best times as a family. An Olympic-sized pool, a splash pad, an adult-only pool and hot tub, snack bar and beverages, lake, paddle boarding and a beach, what else could a family crave? There’s a lot to do here and surely you can find something to do as simple as a libation and a book! 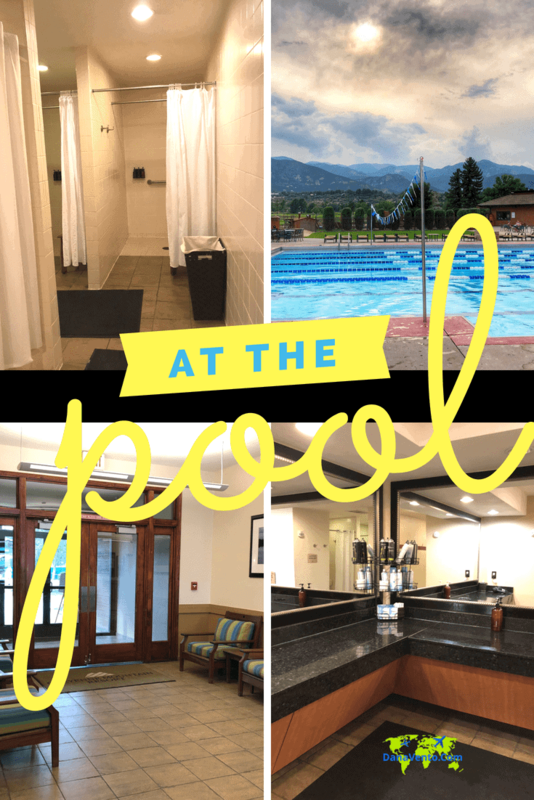 The pool attracts kids not only because it is 5 feet at its deepest point but because there is so much space! Lifeguards were always around the pool while we were there (August). Take a really good look at the seating, the cleanliness, setup and how big this place is! Resort life is all I can say! The bottom and sides of the pool are soft, not cement rough and that is a big deal with kids and pools (my son commented on this right away!). Towels are provided when you sign in and there are spacious locker rooms. Restrooms are available in here as well as a set poolside (on the building). Adults can be at the pool free from the kid zone as well if you did not come with kids! Here’s the adults only pool. No worries, you are pretty secluded over here, and you have great scenery and proximity to the bar (it’s right next to the pool!). As if the pool area is not enough, the luxury of the lake adds even on more options for endless days of fun. Whether you sit on the beach or actively participate in lake sports, there’s a lot to do. It’s peaceful, and busy all at the same time. However, at night, around 6P it quiets down considerably and is perfect for just hanging! We did that a lot, after long days of touring. What comes with your room? 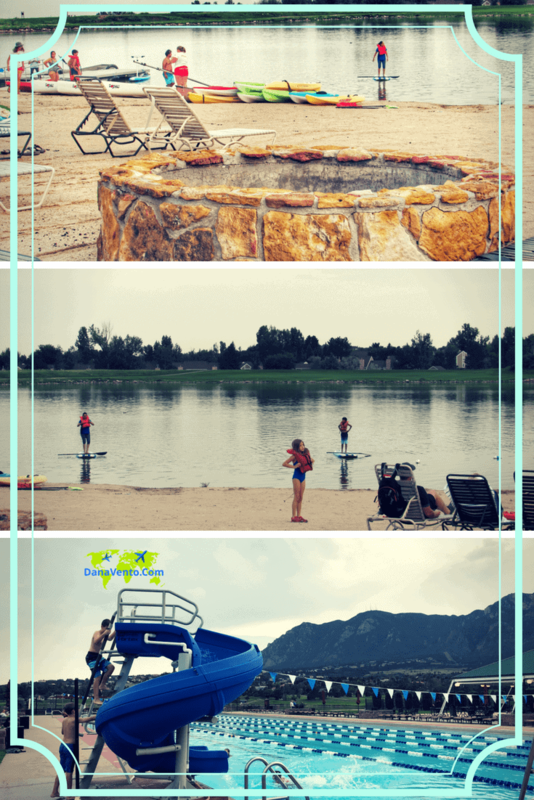 Paddleboarding rentals at no charge, so have fun and let the kids test their skills on the lake. You will find plenty of chaise chairs on the lake beach as well as some chairs. After a full day at the pool, or golfing and playing tennis you need to eat right? If you are too tired to leave, no worries, there are different ways to handle your hungry at the resort. First, there is a gourmet restaurant the Mountain View. 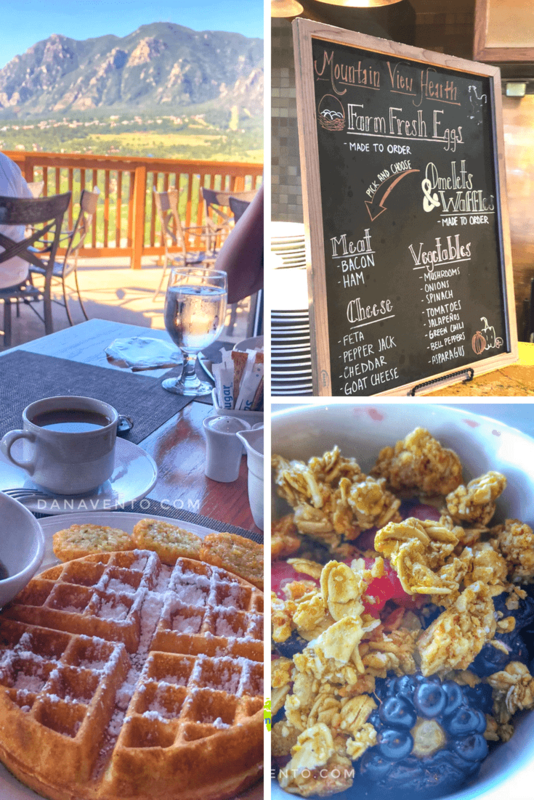 The Mountain View also serves breakfast and lunch and has seating inside as well as limited seating on the terrace with views that all will captivate! We were fortunate enough to dine here 2x while we stayed, once for a weekend breakfast and a Friday night dinner buffet. There were plenty of families dining here and I noted plastic cups with bendy straws so they are ready and waiting for you and your younger families. I loved the wine menu, so many endless choices, and please note, though I am not a beer and ale drinker, there were multiple options for you all as well! It’s not just about the wine, lol! What’s better than a day of vacation than an Italian Meal to round it out? Nothing, lol. While the Italian Buffet is not an every night offering, it was the night we were dining there. Look at the salad station, charcuterie, and other offerings. I am ready to eat again. I guess the foodie side of me is coming out! Our server mentioned it was Italian Buffet night, and I opted to go with that choice. I don’t eat meat, so I chose the salad bar, that included Charcuterie (cheese and olives, etc), as well as Shrimp Carbonara and delicious bread. Yes, I carb-hogged, vacation calories don’t count! There were plenty of choices as you can see in this image, and I apologize ahead of time for the imagery. There were a lot of people and I did not want to snap images of them, it’s their personal time! Oh hello, the weekend is all I can say, this place was poppin’ with families. Dads and grandparents before they were heading out to tee off and kids enjoying breakfast. 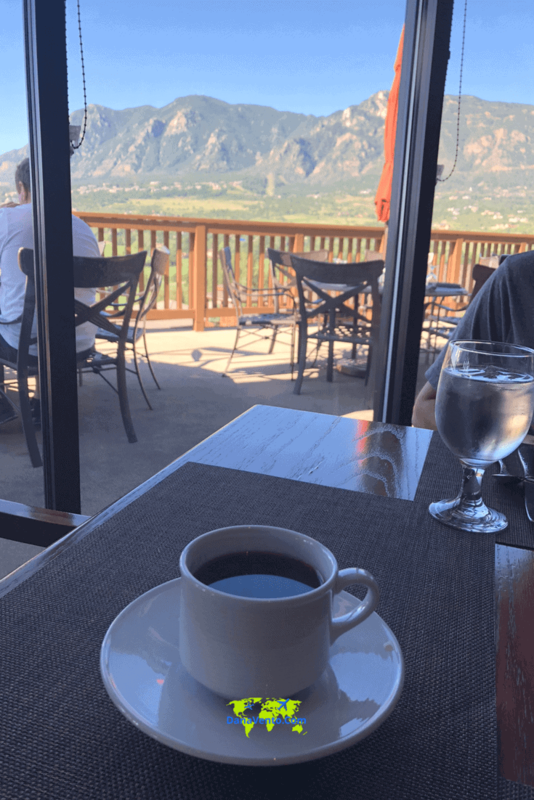 Start with a fresh cup of coffee and ogle at the foot of the Rocky Mountains right out the window, unless you are seated on the terrace. The buffet offered eggs made to order and yummy 14″ waffles. Further, the buffet offered, granola, hot oatmeal, sausage, potatoes, bacon, cartons of milk, juices, pastries and more. You could eat all you want but I dare you too if you can get past the size of the waffle, lol! I am just going to say this, the potato crisps are amazing and I am still thinking about them. However, they are created makes them the best! Get them on your breakfast plate, and it is the pan they were refiling the most while I was there, so I am not alone in my affection for these crispy treats! Our days passed too quickly, and I want to go back. The resort is centrally located. It’s within about 15 minutes of the Garden of the Gods, about 20 minutes to Manitou Springs, and 45 minutes to an hour from the Royal Gorge Region. Simply ideal for getting everywhere.